PhilFest 2018: A Celebration of Filipino-American Festivities of its kind! Photos Credits: Nhick Ramiro Pacis, Lorna Smith, Philfest/ PCFI Org. Filipinos and Americans alike travel from afar, making sure not to miss this annual event full of celebrations. Because coming to PhilFest is like going to the Philippines without the expensive airfare and the 19 hours flight. Just imagine yourself arriving in a small Philippine town called “The Philippine Enrichment Complex” in Tampa, Florida with thousands of people trying to get the nearest parking. First, you are greeted with a huge “Fiesta arch” welcoming everybody to the festival. Then as you purchase your $7 tickets to enter, you are even given the option of “Veteran’s with Valid ID” line which allows all veterans, Filipinos and Americans alike, enter free with their families. Even children 5 and under also enter free of charge. Once you step your first foot in the festival grounds you are immediately greeted by beautiful Filipinos dressed in their best outfits saying, “Welcome and Mabuhay!” The first thing you will see is a special build full scale “Bahay Kubo” (a typical Philippine nipa hut) beautifully decorated. You can even walk-in the Bahay Kubo and see some cultural displays on exhibits. The next thing one does is buy your “coupons” from coupon booths spread all over the festival. The festival does not allow cash payments and transactions to control all vendors sales and later donate to the foundation certain percentage of their sales for the foundations cultural projects and maintenance of the entire 10-acre property. Different member organizations from all over Tampa Bay also sell specialty foods like “Kambing” by the Ilocano’s, Magnolia Ice Cream by the Bicolano’s, “Saging Variety” by Bisayan’s, “Torta” other Bohol delicacies by the Boholano’s. But one of the highlights of PhilFest is the non-stop entertainment during the 3-day event prepared by Entertainment Chairman, composer and conductor of the Bamboo orchestra Nhick Ramiro-Pacis. Just watching the entertainment at PhilFest makes you stay the whole day if not the whole 3 days. Why? Here are just some of the highlights, on Friday come the spectacular “Cultural Night” production Directed by Joey Omila where in the three-cultural group of the foundation perform as one. Music, songs, and dances in one big production. This is followed by a singing competition called, “Tawag ng Tanghalan” with contestants competing for the first place. This competition has sent two winners in American Idol and became finalists. Friday evening ends with dance music provided by a fantastic DJ called “DJ Valenti.” This year was special to PhilFest with the unveiling of the Rizal Monument by members of the Knights of Rizal attended by presidents and officers of the different Philippine organizations. Saturday is the longest day of the festival. Gates open at 10 am with a live concert by the “Man of a Thousand Voices” Aba Villagomeza taking the center stage singing interpretations from Louis Armstrong to Philippine balladeer Anthony Castello. Highlights for Saturday are the “TFC Hour” with popular movie stars from the Philippines is provided by ABS/CBN Philippine Network through the recommendation of Fernando Solis and Riza Abadia publishers of “PINOY AT IBA PA” and organizers of the Fiesta Mo Sa Florida; the Grand Flores de PhilFest parade, REVOLUTION Hip-hop competition, Sumba, Latin Portion, Classical and contemporary ballet, and performances of Philippine folk dances from different dance groups all over Florida including Tampa’s very own the Philippine Performing Arts Company. Then Sunday starts with a celebration of the Holy Mass on site before the start of the festival. The one of the highlight for Sunday is the “Tanghalan Pambata” talent competition where children ages 4-15 show off their hidden talents to win the First Place of $500. Then there is the street parade participated by all the organizations called “YUGYUGAN” which means, “shake you boogie,” where people can join and dance just like the festivals in the Philippines. And the finale of all is the crowning of the Miss, Ms. Mrs. PhilFest from participation organizations. This year, ILOCANO USA represented by beautiful Lorna Smith who won the crown of MRS. PHILFEST 2018. Within the property also stands the magnificent and spectacular Bayanihan Arts & Events Center that seats about a thousand guests in a theater set up, or 500 people in a Banquet setup. The center is transformed into an exhibition hall during PhilFest for people to enjoy the cultural exhibits of clothes, costumes, instruments, art works, mostly loaned by members of the Philippine community. 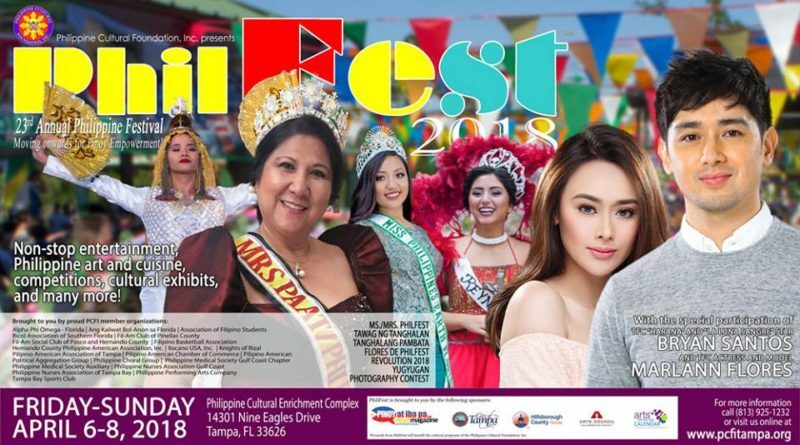 No question, PhilFest of Tampa today is now known as the biggest and most attended Philippine festival in the East Coast and the only festival in America that takes place in a 10-acre property owned and managed by the Philippine community of organization of the Philippine Cultural Foundation, Inc. The festival which normally takes place every first weekend of April, depending on when the religious Holy Week which is devoted celebrated by Filipinos takes place. This festival is a must to attend every year. Fantastic site. Lots of useful info here. I’m sending it to a few friends ans also sharing in delicious. And obviously, thanks for your sweat! I am just writing to let you know of the beneficial discovery our princess gained going through your web site. She even learned numerous pieces, most notably what it’s like to have a marvelous teaching character to have the rest really easily comprehend certain hard to do topics. You truly exceeded people’s expectations. Many thanks for offering these insightful, trusted, edifying and also easy tips on that topic to Jane. I really wanted to develop a simple word in order to express gratitude to you for all of the magnificent points you are writing here. My time consuming internet lookup has now been paid with good facts and strategies to write about with my neighbours. I would state that that most of us visitors are quite blessed to dwell in a great website with very many special professionals with very helpful techniques. I feel very much fortunate to have used your entire web site and look forward to really more awesome minutes reading here. Thank you again for a lot of things. I needed to draft you a very little word to give thanks as before for those pretty suggestions you’ve provided here. It was simply open-handed of people like you to allow extensively all that most of us could have offered for sale as an ebook to help make some money for their own end, mostly now that you might well have done it in case you decided. These guidelines additionally served as a good way to recognize that many people have the identical interest like my own to figure out more with reference to this problem. I believe there are millions of more pleasurable opportunities up front for people who take a look at your website. I wish to show appreciation to you just for rescuing me from this type of incident. Right after looking through the the net and finding solutions that were not powerful, I was thinking my entire life was well over. Being alive minus the strategies to the difficulties you’ve fixed by way of your entire write-up is a crucial case, and those that could have in a wrong way affected my entire career if I hadn’t discovered your website. Your main capability and kindness in maneuvering every part was tremendous. I’m not sure what I would have done if I hadn’t encountered such a solution like this. I am able to at this point relish my future. Thank you so much for your professional and result oriented help. I won’t be reluctant to endorse the website to anybody who desires direction about this issue. I simply desired to say thanks again. I do not know the things that I could possibly have used in the absence of the actual concepts contributed by you over my concern. It absolutely was the depressing condition in my position, but finding out the very expert form you dealt with the issue forced me to weep for gladness. I am happier for your advice and in addition wish you are aware of a powerful job you are always accomplishing teaching many people through the use of your websites. More than likely you have never met any of us. I wanted to draft you a very little observation just to give many thanks again just for the pretty opinions you have shared here. It has been quite strangely generous of you to grant extensively precisely what most people might have supplied as an e-book to generate some money for themselves, mostly since you might well have done it if you decided. Those concepts as well acted to be a good way to comprehend other individuals have the same fervor the same as my personal own to see very much more related to this issue. I’m certain there are many more enjoyable sessions ahead for people who look into your site. I wanted to write you the very small remark to finally say thanks a lot the moment again for these spectacular ideas you’ve discussed on this page. It’s quite surprisingly generous of you to offer without restraint exactly what many individuals could have offered for sale for an e-book to generate some dough on their own, certainly now that you might have done it in case you decided. These tips likewise worked to become a easy way to be sure that someone else have the same desire like my own to see a lot more around this problem. I’m certain there are several more pleasant times in the future for those who view your blog post. A lot of thanks for your own labor on this web site. Kim takes pleasure in going through internet research and it’s really obvious why. Most of us learn all of the lively means you offer worthwhile thoughts through this web blog and as well as improve contribution from some other people on that point so my girl is without question starting to learn a lot of things. Have fun with the remaining portion of the year. You’re the one doing a remarkable job. I must express my thanks to you just for rescuing me from such a dilemma. After looking throughout the the net and seeing tips which were not helpful, I thought my life was well over. Being alive without the presence of answers to the problems you’ve fixed all through this website is a critical case, and those that might have in a negative way damaged my entire career if I had not noticed your website. That training and kindness in touching all the pieces was very helpful. I’m not sure what I would have done if I had not come across such a stuff like this. I can now relish my future. Thank you very much for this expert and result oriented help. I won’t hesitate to recommend your web sites to anyone who ought to have direction about this matter. I truly wanted to compose a brief word to say thanks to you for these pleasant guides you are showing at this site. My particularly long internet look up has finally been compensated with useful facts and strategies to share with my friends. I would claim that most of us readers are rather fortunate to live in a superb community with so many brilliant professionals with very helpful tactics. I feel somewhat happy to have used the webpage and look forward to many more exciting minutes reading here. Thanks a lot once again for all the details. I simply had to thank you very much all over again. I am not sure what I could possibly have used in the absence of the type of thoughts shown by you over my concern. It was a real frightening crisis for me personally, however , finding out the expert way you processed it forced me to jump over gladness. I am thankful for this guidance and even wish you know what an amazing job that you are putting in educating some other people through the use of a site. Most likely you’ve never encountered all of us. I not to mention my guys were found to be taking note of the good guides found on the blog then at once I got a horrible feeling I had not expressed respect to the site owner for those tips. My young men were definitely consequently excited to see all of them and have in effect very much been tapping into those things. Thanks for indeed being considerably thoughtful and then for deciding upon variety of smart subject areas most people are really desirous to learn about. My honest apologies for not expressing gratitude to you sooner. I enjoy you because of all of the work on this web site. My daughter really loves carrying out research and it’s really easy to see why. I notice all relating to the powerful manner you provide very helpful items via this website and as well improve contribution from some other people on the situation and our favorite girl is undoubtedly becoming educated a great deal. Take advantage of the remaining portion of the year. You are performing a splendid job.